All over the World, Miracles are taking place, on a wintery highway in Quebec a man crashes his car and survives, in New York a homeless person is run over by a bus and lives. In Tokyo, a teenager jumps off a high rise building and fails in taking her own life. While many see these marvels as a positive sign from God, over the next seven days some will begin to suspect the truth behind these portents, a few will even search for it and one man will find it. And in seven days, all hell will break loose. 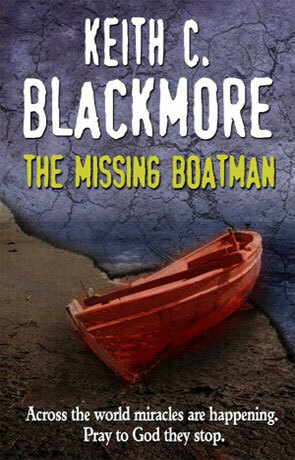 The Missing Boatman is a real treat, a dark urban fantasy that at times reminds me of Maurice Broaddus Breton Court series, it has the same sharp edge and propensity towards explicit language and fairly graphic, descriptive violence - an almost visual acuity that helps to emphasise the action. A warning for those younger or more easily offended readers - this book isn't for you. It does however have it's own distinct feel with an erudite voice that shouts out from the pages and a pervasive dark and subtle humour prevents the novel from becoming too grim. As I began reading I was immediately struck with the quality of the prose, jumping straight in with little introduction we get a crash course in the dark and seedy underworld that most of the books colourful characters inhabit - the minimal background is handled by effective use of exposition which keeps the pace on an even keel. The characters themselves, while not always likeable are nonetheless very powerful figures and do becoming quite engaging. The use of omnipotent antagonists is also carried out very well, often when figures that are godlike in power are used in a story it can be very difficult to stop them from appearing overbearing and subjugating the story - here the author has managed to avoid that hazard and the result adds to the rich narrative and enthralling characters. This isn't a book to give in to black and white portayals, everyone here is a shade of grey, with some a darker grey than others. Right from the start the author manages to play with the readers emotions, drawing them to a character only to have him or her discarded in a bloody mess and it wasn't until I was a good third of the way through the book that I realised who the protagonist was supposed to be. The actual story is very well played out with enough twists and turns to keep the reader interested while the pace is set just right and stays on a fairly even keel throughout. The Missing Boatman has a strong style, a street-smart tale that pulls no punches and delivers a fantastic story, recommended. Written on 4th July 2011 by Ant.